The toxic effects of thyroxine (T4F), levothyroxine (L-T4), and thyroxine complexed into β-cyclodextrin (β-CD-T4) on the biological parameters of tambaqui (Colossoma macropomum) were evaluated. The animals were exposed to a chronic toxicity test based on concentrations of influent (60 ng/L) for 2 months. Weight, total length, animal behavior, oxygen consumption, photopic electroretinogram (ERG), and the Flicker exam were evaluated. No significant differences were observed (p > 0.05) on the weight and total length measurements between all groups studied. Behavioral observations of the animals exposed to L-T4 and β-CD-T4 complex showed a reduction (p < 0.05) in slow swimming and an increase in staying motionless events. The animals exposed to the β-CD-T4 complex presented the highest O2 consumption. L-T4 and β-CD-T4 promoted a reduction in the ability of the animals to respond to stimuli in the photoreceptors according to the photopic ERG examination. Data from the experimental Flicker exam showed no significant differences (p > 0.05) in all groups studied. 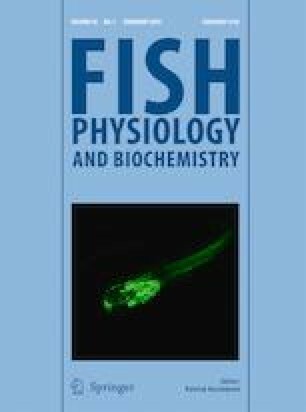 It can be concluded that the complexation of T4 into β-CD and L-T4 modified the toxicity of this hormone, promoting changes in the behavior, oxygen consumption, and electrophysiological responses of the exposed animals, suggesting that inclusion complexes should be submitted to new toxicity tests to ensure higher safety. Thamiris Pinheiro Santos, Priscila Rafaela Leão Soares, Marília Cordeiro Galvão da Silva, Stephannie Caroline Barros Lucas da Silva, André Lucas Correa de Andrade, Amanda Rodrigues dos Santos, Jadson Freitas da Silva, Elyda Grazyelle da Silva Oliveira, Elton Hugo Lima da Silva Souza, Fabrício Bezerra de Sá, Marilia Ribeiro Sales Cadena and Pabyton Gonçalves Cadena contributed equally to this work. The Universidade Federal Rural de Pernambuco, Brazilian National Council for Research–CNPq (Grant #477215/2013-0) and Fundação de Amparo à Ciência e Tecnologia de Pernambuco–FACEPE (Grant #APQ-0933-2.08/15) provided financial support and the Coordenação de Aperfeiçoamento de Pessoal de Nível Superior (CAPES) provided scholarship.